With surrounding mountains and expansive lake views, Route 97 through the Okanagan Corridor is one of BC’s top scenic drives. In the winter, the sweeping landscape is enveloped in glistening tones of white and blue. Be sure that your vehicle or RV is ready for winter and always check road conditions in advance of your trip. The colder weather brings with it the perfect opportunity to enjoy the elegant, bold reds the Okanagan is so good at crafting. Try out the exceptional vintages garnering international attention, and raise your glass to the upcoming year. Meet the winemakers and savour new releases in an intimate setting at Big Reds at Big White, check out one of the many events at the Sun Peaks Okanagan Winter Wine Fest., or embrace the best of local flavours at Winter in Wine Country. What could be more magical than waking up in a winter wonderland? Enjoy the warmth of a roaring fire with mulled wine in hand, unwind in the great outdoors, and try your hand at winter camping. With many RV Parks and Provincial Campgrounds open year-round, escape to the Okanagan for the ultimate winter getaway. The Okanagan is home to a multitude of mountain resorts so you don’t have to travel far to hit the slopes. Known for unparalleled champagne powder, the mountains boast beautiful villages that will get you right into the festive spirit. And you don’t have to ski to enjoy the winter culture. From dog-sledding and ice-fishing to a horse-drawn sleigh ride to a rustic cabin in the woods – there’s an array of wonderful experiences for anyone looking to embrace the snow season. 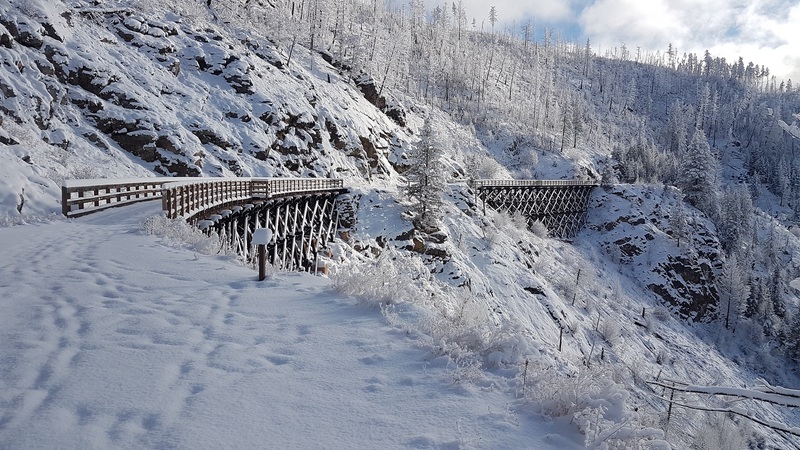 Explore the historic Kettle Valley Rail Trail in the winter with a guided snowshoe tour. With this easy, flat adventure you’ll see 11 trestles and 2 tunnels as Trailhead Ed talks you through the local history and lore. 0 thoughts on "5 Ways to Enjoy Winter in Wine Country, Okanagan, British Columbia"